Half the fun of collecting action figures is finding interesting ways to display them. In this step-by-step, we'll take a look at a simple way to make great custom backgrounds that will add just the right touch to your favorite figures. 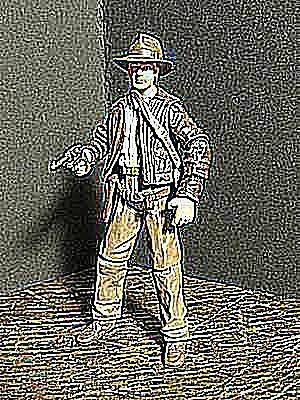 In this particular case, we'll take a 3 3/4" Indiana Jones figure an build him a custom background a little more befitting the intrepid archaeologist that just sticking him on any old shelf. In order to find the right background for your figure, you'll need to hunt down a good image that fits the character. You can find interesting backgrounds in old magazines or calenders, but in this case I wanted Indy to be standing in front of some old ruins, so a simple Google Image Search for the term "Mayan ruins" brought up several great choices. A good tip is to search for "extra large images" in Google, so you're guaranteed it will print nicely. You may also need some basic photo editing software to resize the image to the dimensions you want. For 3 3/4" action figures, an image that prints out to around 9 x 6" seems to be just right. Once you have found your image, resized it, and printed it out, you'll need to gather some other basic supplies. You'll need the printed image, a piece of poster board (black works best, but is not necessary) that is a little larger than your printed image, a pair of scissors, a glue stick (spray adhesive or double-sided tape works as well), and of course, an action figure. The first step is to glue down your background image to the poster board. This will give the background display a little extra sturdiness. When gluing the image down, make sure you get adhesive all the way to the edges to prevent open spots. Once it's glued down, flatten it as much as possible to get out any air bubbles or warping. A useful tip is to glue down the image with its bottom edge right up against a straight edge of the poster board. This guarantees that you'll have a nice nice, straight bottom to your display and avoid an wobbling. Once the glue is dried, which should only take a few minutes, you can now use the scissors to cut away the excess poster board. Cut right up to the line of where the image meets the board. If you're feeling creative, you can cut the upper part of the background in an interesting shape, for example, following the tops of the trees or any buildings. But for now we'll keep it simple. Now it's time to give the background a fold. Fold the background exactly in half along the bottom edge of the image. Once it's folded over, press the folded part down firmly, making a good crease along the edge. This will give your background the ability to stand on its own by opening it back up at a 90° angle. You can now set your background up on its bottom edge and it will stand on its own. This makes for a nice little display area for your figure to stand. Now that you've made your background, simply stand your figure within it and enjoy that little extra something that you get with a custom background. Also, once your fellow collectors wonder where you got such a cool display, you get to brag about having made it yourself. This will work for just about any figure. Imagine the possibilities! You could use a desert scene for your collection of Jawas, or a picture taken on an aircraft carrier for your favorite G.I. Joes. Now that you know how to make them, you're limited only to your own imagination!